One weekend, we baked several breads. I have been lazy in terms of baking bread and my wife took over most of my baking chores. 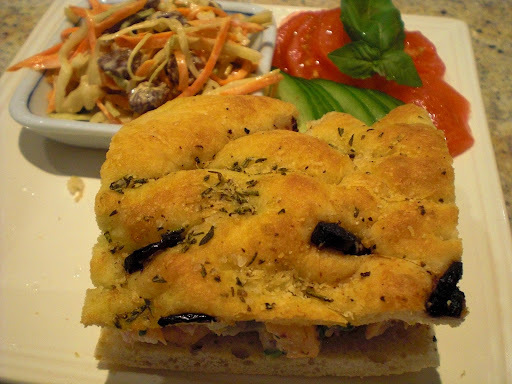 I decided to bake a simple focaccia bread to use it for sandwiches during the following week. 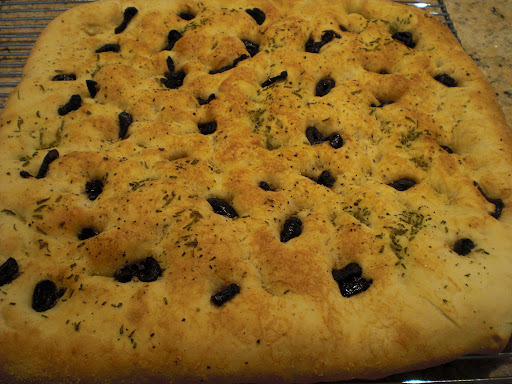 I baked two focaccia which were a bit over 11 x 13 inches. When the bread comes out of the oven, I usually cut off the four edges and eat these pieces like grissini dipped in salted olive oil while hot, which is very good. After the remaining bread cools down, I cut the sheet of focaccia into eight uniform rectangular pieces for sandwiches. The picture below is half a sandwich. For a lunch on Sunday, I made salmon salad from leftover salmon. The salmon was our regular menu. It was simply salted, peppered and cooked in a frying pan and finished in an oven. We usually leave half of the salmon (although we finish the crispy skin) and use it for something else later. Salmon Salad: I just flaked the cooked leftover salmon (about 1/3 lb). I realized we were totally out of celery but if we had some, I would have used it finely chopped. Instead, I used cucumber (one American mini, cut in half lengthwise and then thinly sliced, salted and excess moisture squeezed out). I also added finely chopped parsley (few sprigs), finely diced Vidalia onion (small, half) and cornichon pickles (5-6 finely diced). For dressing, I mixed mayonnaise (2 tbs), Greek yogurt (2 tbs), Dijon mustard (1 tsp), and lemon juice (1 tsp), salt ad pepper. 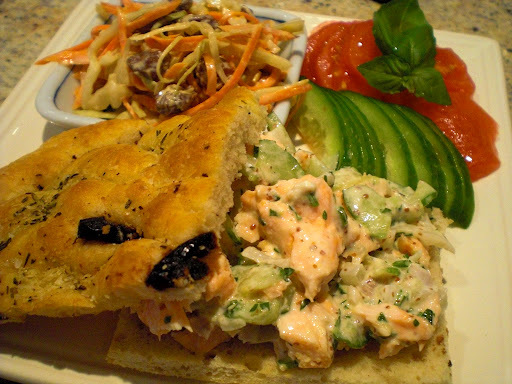 I sliced the focaccia bread into two layers and put the salmon salad on top (picture above). I served this with coleslaw and sliced cucumber, skinned and sliced Campari tomato. Focaccia bread: I essentially used the same dough as for my pizza. I placed bread flour (3 and half cup), Kosher salt (1 tsp) and light olive oil (2 tbs) in a food processor with a dough blade installed. I mixed them by running it at low speed for 10 seconds. Meanwhile I proofed the yeast by adding a package of dry yeast into 1/4 cup of lukewarm water with a small pinch of sugar and mixed well. I let it stand until it started foaming. I added enough cold water to make it 1 cup and mixed it well. While the food processor was on low speed, I streamed in the water yeast mixture. I usually add a few more Tbs. of water as I watch the dough form above the blade. I touch the dough to test its consistency. It should be slightly sticky and rather soft. If not you can add more water. I let it rest for 5 minutes so that the moisture distributes evenly. I then ran the food processor on low speed for 30 seconds. I dumped the dough out on the floured board and hand kneaded to finish until it was elastic and smooth (about 5 more minutes). I made a tight ball with the surface of the dough stretched and place it in a one-gallon Ziploc bag with the inside sprayed with PAM non-stick spray (or use olive oil). I removed as much air as possible, sealed, left it on the counter top loosely covered with towels and let it rise for 1-2 hours or until the volume doubled. I deflated and folded the dough, divided it into two equal portions and formed them into rough rectangles. I covered them with a dish towel and let them rest for 10-15 minutes until the gluten relaxed. I then formed the dough into about 11×13 inch rectangles (If you like, you could make thicker and smaller rectangles, in that case I would use lower temp, 350F, and longer baking time, 30 minutes). I put a thin layer of cornmeal on a wooden pizza peel and place the dough on top. I slid the dough back and force on the peel by jerking the peel to make sure the dough was not sticking at the bottom. 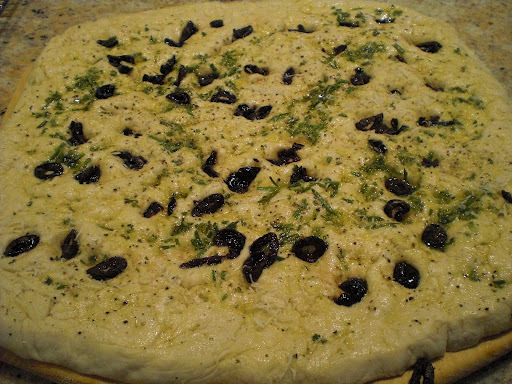 I generously brushed the dough with olive oil/ fresh chopped rosemary mixture and garnish it with oil-cured black olives (pitted and chopped). Using my fingers, I made multiple indentations especially over the olives so that they don’t not come off easily. Finally I grated Reggiano parmigiano cheese on the top. I slid the dough onto the baking stone in a 400F oven (preheated for at least 20 minutes after it reached 400F) and baked the dough for 20 minutes (below). My foccacia was rather thin (but thick enough to cut into two layers for a sandwich) with crust but as I mentioned before, you could make it thicker and less crusty. Sometimes I make another variation in which I formed the dough exactly like pizza to make very thin pizza-like focaccia bread with olive oil and rosemary.